I have been so busy exercising my Mummyness lately (that’s code for cleaning and re-organising my house) that I haven’t had time to share some of the great recipes I collected from my mother-in-law’s stash of cookbooks. 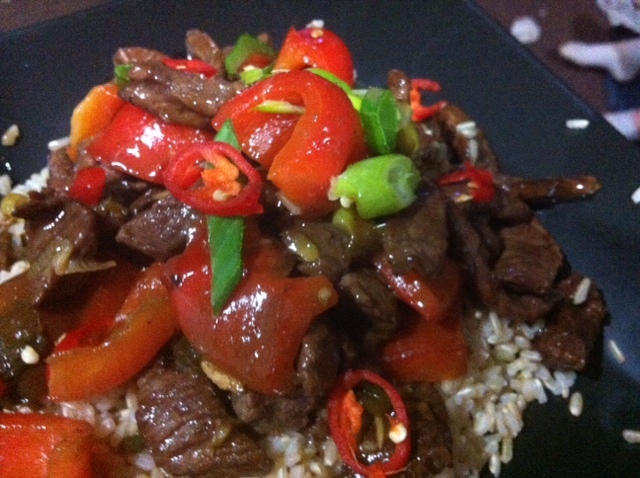 But today I have decided to take a quick break and share this recipe for Ginger Beef. We like it so much we have had it twice in the last week. Well, the fact that it’s super-quick and I generally have all of the ingredients in my kitchen is another reason we have had it twice in the last week, but I’m going to go with “We really like it!” Mr 8 tells me the flavours are very authentic and it’s just like he has it in Malaysia, which has practically been his home away from home for the last 10 years, so that’s pretty decent praise, don’t you think?! I added some sliced chilli to the recipe, so if you don’t think the kids can handle it, just exclude it and you’ll still have a great mid-week meal. Place the thinly sliced steak in a bowl. Combine the cornflour, oil and soy sauce in a small bowl, mix well and then pour mixture over the steak. Thinly slice the ginger and place it in another bowl along with the vinegar, sugar and salt. Marinate for 20 minutes or longer. Heat extra oil in a wok or pan and add the meat slices, gradually spreading out in the pan. Brown both sides, cooking quickly and only until the meat is tender. Add the ginger and liquid to the pan along with the capsicum, shallots and chilli (reserving a few slices for garnish). Cook quickly, stirring for 2-3 minutes. Return the meat to the pan and cook for a further minute, stirring constantly. Serve over rice, garnished with thinly sliced chilli and shallots.